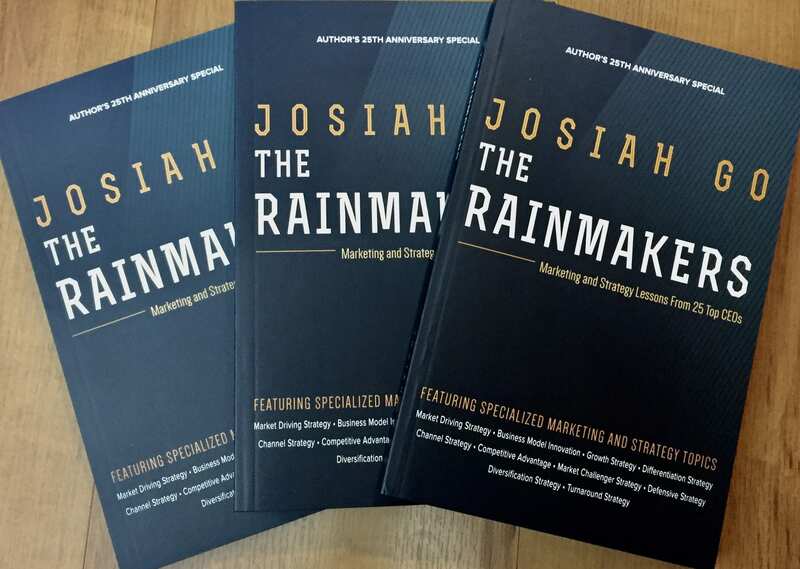 Josiah Go’s ALL NEW Strategic Marketing Course. Module 1: How Does Your Industry Work? Module 2: How Does Your Business Operate and Make Money? Module 3: How Does Your Competitors Think? Module 4: How Does Consumer and Customer Get Satisfaction? Module 5: How Can You Reinvent Your Strategy? Module 6: How Does Selected Analytical Tools Compare? “It widens my perspective in Marketing & how this would translate in wider market share” — Christian Neil Belo, HR & ADM Manager, Steelasia Manufacturing Corp.
“The speaker Mr. Josiah Go opened new/unrealized area and ways to gain not only sales but profit” –Donabel Fernandez, Italianni’s – Asst. Brand Manager, Bistro Americano Corp.
General Manager of Jaka Food Processing Corp. Managing Director of SQL Wizard Inc.
Senior Vice President of Grepalife Financial, Inc.
Senior Vice President of Security Bank Corp.
AVP for Sales & Marketing of Flyace Corp.
AVP, Product and Marketing of JG Summit Petrochemical Corp. Product Marketing Manager of Electrolux Phils Inc. Region Commercial Manager of Coca-Cola Bottlers Phils. JOSIAH GO is chairman of 12 corporations and author of 13 bestselling marketing books. His specialization is in the area of market-driving strategy, business model innovation, profit strategy and innopreneurship where he has personally facilitated over 500 marketing, strategy and innovation workshops here and abroad since 1990.He took advanced marketing and innovation programs at MIT Sloan,Kellogg,London Business School, Wharton and at the Blue Ocean Strategy Institute.For pioneering and successfully sharing many educational initiatives, “Joe” was honored as one of the Ten Outstanding Young Men (TOYM) of the Philippines in 2001, and one of the Ten Outstanding Young Persons (TOYP) of the World in 2002 in the field of business education, and was awarded by his peers the rare Lifetime Achievement Award in 2007 by the Association of Marketing Educators. He was also recently accorded the World Brand Leadership Award in 2009. .